The 2016-2017 wrestling season is officially underway as Whitman clashed with Rockville on December 7th. The Rockville Rams were somewhat of an unknown entity as we have not faced them since the 2014-2015 season when the Vikings were victorious 37-24. This time however the outcome was different with the Rams on top 42 to 32. The starting Whitman line-up this year is comprised of lots of new faces. Only 4 Varsity wrestlers returned from last year’s dominant lineup that went 11-2 in regular season action. Returning from last year’s lineup are Clark Boinis at 126, Max Gersch at 138, James Mackall at 145 and John Luke Iglesias at 220. This makes for one of the youngest lineups the Vikings have fielded in recent memory with 10 spots being filled with new Varsity wrestlers. However, even with this relatively inexperienced lineup, the Vikings held their own and almost came away victorious. 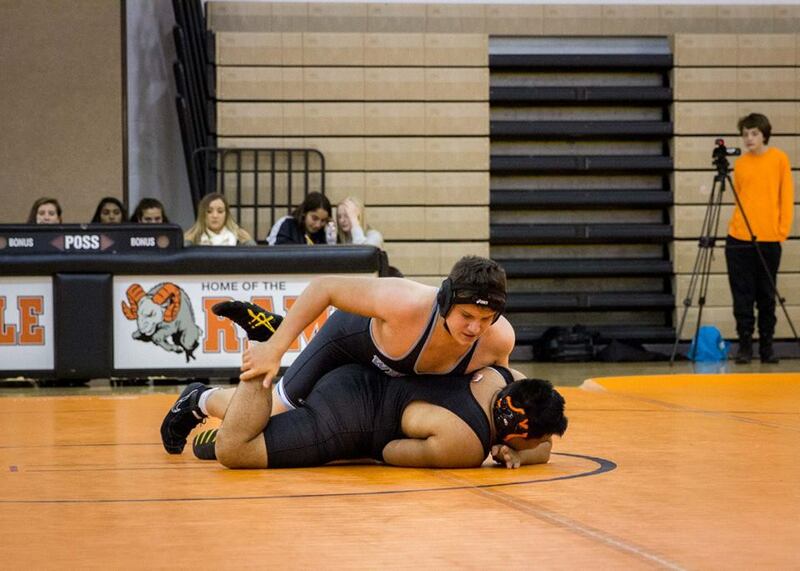 The first match of the season opener featured Freshman Nick Roy at 106. Nick held his own in the first period but was eventually pinned in the 2nd period. The second match also featured a Freshman in Sean Fleming, Sean wrestled three full periods and won a major decision with an impressive 21-8 score. Next up at 120 was Freshman Peyton Casamento who showed his years of mat work experience and skillfully shut out his opponent 7-0. The fourth match of the evening featured Junior Clark Boinis at 126 who quickly pinned his opponent with a cradle in under a minute. Up next at 130 was Freshman Luke Cullinane. Luke battled throughout the first period and was pinned just as time was running out. The next match at 138 featured Sophomore Max Gersch. Max wrestled well and turned in a convincing 10-5 win over his opponent. Following Gersch was Junior James Mackall at 145. James also looked polished and carded a 9-1 major decision over his opponent who was never really in the match. At this halfway point in the match the Vikings led the Rams by a score of 20-12. As the second half of the match got underway the Vikings’ luck began to turn as our next three wrestlers were all pinned, thus losing a total of 18 points. I am sure the coaches will be looking at the film footage and encouraging Sophomore Sang Hanna at 152, Freshman Sebastian Turkewitz at 160 and Freshman John Makall at 170 to do better next time. At this point in the contest Senior Mason Austin-Brantley had had enough and stepped in to stop the bleeding. Mason’s three years of experience showed as he manhandled his opponent and pinned him early in the second period, thus leaving Whitman only 4 points off the lead at 30-26. The last three matches featured Whitman’s heavyweights including Sophomore Yussef Zaki at 195, Junior John Luke Iglesias at 220 and Sophomore Tom Wilmarth at 285. While both Yussef and John Luke were pinned, Tom fared much better. In his first wrestling match ever Tom, pictured above, recorded a pin for his team. Tom wrestled very well throughout his first contest and was in control of his match 9-3 when he triumphantly pinned his opponent in the third period with a cradle. After the Varsity matches were concluded the Whitman JV wrestlers took the mat. In the eight JV matches that ensued against their Ram opponents they recorded 7 pins, which was quite an impressive showing. In the previous Season of Legacies article I failed to mention that we are fortunate to have yet another legacy wrestler this season. Sophomore Robb Barrett has joined the team this year. Robb’s older brother Connor (2015) was a two year grappler for the Vikings. I would be remiss if I did not take this opportunity to thank my predecessor Craig Bamberger (father of 2016 graduate James) for the time and effort he put into this website. Craig reported on every match last season and kept us all up to date on the key match-ups and results throughout the season.